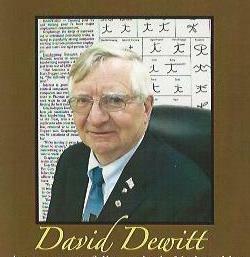 About David J. DeWitt | David J. DeWitt, C.G.A. Mr. DeWitt is a professional Graphologist and a certified Graphoanalyst, who shows how you can get a grasp of the fundamental rules of handwriting analysis and find out about yourself and others. He is the author of the book, “HANDWRITING ANALYSIS… Discover Your Own Vocational/Career Potential”, a guide to discover 40 jobs to fit your personality, published by Outskirts Press, Inc. Since his early years in the US Army, he has been lecturing publicly on handwriting analysis to organizations, clubs, schools and colleges. His new book: “BULLYING… Applying Handwriting Analysis To Detect Danger Signs and Effects” represents his same easy step-by-step approach in spotting projective behavioral patterns in handwriting in the same way that body language expressions are evident. With the help of graphology, he seeks to provide insight and an additional screening tool for bullying behavior prediction from handwriting to complement traditional approaches. That was so cool! Thank you can’t wait to get the book and learn more about my hand writing! Very interesting! Would love to read the book! Excellent! Informative and exciting at the same time. It grabs your attention and you can’t help but give in to your innate curiosity to discover and learn more. You have a winner and I like the music.